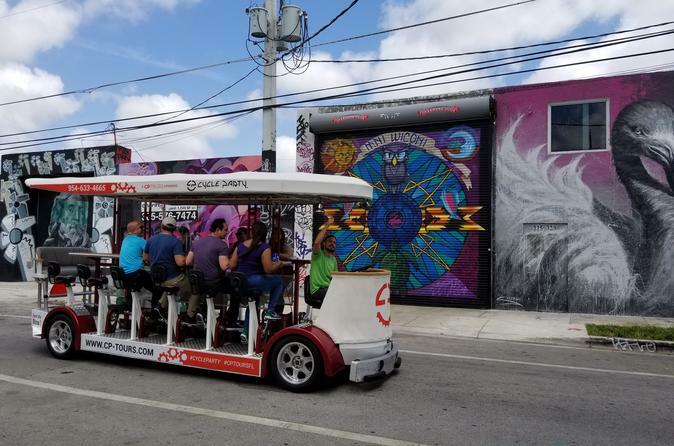 Check out the best Happy Hour spots in the beautiful Wynwood neighborhood while traveling aboard the super fun Party Bike. Each party bike will come with a guide, music and an unforgettable adventure. Cycle Party's happy hour tour takes you on a 2 hour tour to the best happy hour spots in Wynwood. Each bike can fit up to 15 people, making it great for birthdays, bachelor/ette parties or just a group looking for a fun time. During the tour, you'll get a chance to check out as many bars as you can do in two hours. Grab you drink and go or hang out and enjoy each bars' ambiance. Once you're ready to go, you're welcome to bring your drink from the bar back onto the bike to take with you while you ride around the neighborhood. Listen to music, pedal and have an unforgettable experience.